…so we need to get more comfortable in the grey. Earlier this month Dmitri Siegel wrote a nice piece on Design Observer about environmental and social implications of the canvas bag. While pointing out that from a social point of view it’s great that designers and consumers are embracing new ideas about individual responsibility, canvas (or any reuseable) bags are often worse for the environment than their plastic and paper counterparts. Unless they’re reused 400 times or more, he says, we’re better off sticking to plastic. Siegel goes on to discuss other method’s of limiting the environmental impact of shopping bags, such as Ireland’s government charging 15 cents for every bag used in the store, or San Francisco banning plastic bags altogether. And as much as I love the variety and beauty of the reuseable shopping bags that have been all the rage recently, and am encouraged by the altruistic intention of those buying and using them (assuming there’s no eco-vanity involved), systematic redesigns like those in Ireland and here in San Francisco are far more appropriate and impactful than a product design. Ireland’s plan, for example, has cut consumption of bags by 90%, and I think a modified approach could potentially reduce it further. Howies, a clothing company based in Wales, has always impressed me with the quality of their work and their devotion to creating a more sustainable business. I was lucky enough to visit their shop in London while traveling last week, and fell in love. What was a little crush has now turned into the real deal. What pushed me over the line was their Hand-Me-Down line, which right now is just a jacket and bag, but will hopefully be extended across a wider variety of products in the future. Although all of their clothes are designed to last, the HMD line is designed to last forever (or close to it, at least). Guaranteeing that it will last at least 10 years (and it’s probably capable of lasting much longer), Howies has designed these pieces to be passed down through the family, and has even designed in a multi-generational nametag (shown above). Howies, I love you. Even though I can’t afford you, I love you. And I love your Rocking Chair Test. the roof, the roof, the roof is all white! To be honest, I’m not entirely sure how I feel about the pending bailout of Detroit automakers. Philosophically I’m opposed to it, as the bed-sharing and hand-holding of industry and government has done little good and plenty bad in the past. In practice it’s not that simple, as millions of jobs and entire city and state economies are at stake. Regardless of what happens with the bailout, though, it’s become clear that true innovation in the automotive industry, which is necessary and long overdue, will not be born in conference rooms in Detroit or on Capitol Hill in Washington. Rather, true innovation and progress will come from start-ups across the world focused on redesigning not only the car, but the entire transportation system. I’ve written before about my love for Zipcar and other car sharing programs, but it’s going to take more than car sharing to make a dent in the way people think about cars. Tesla Motors is selling the most impressive electric car, but it retails for $109,000, and doesn’t solve the problem of recharging remotely. Zenn, Fisker, Venturi, Th!nk and others are all selling (or planning to sell) electric cars as well, but they all succumb to the same problem of remote recharging. What’s needed is not just a new car, as I said, but a new infrastructure. 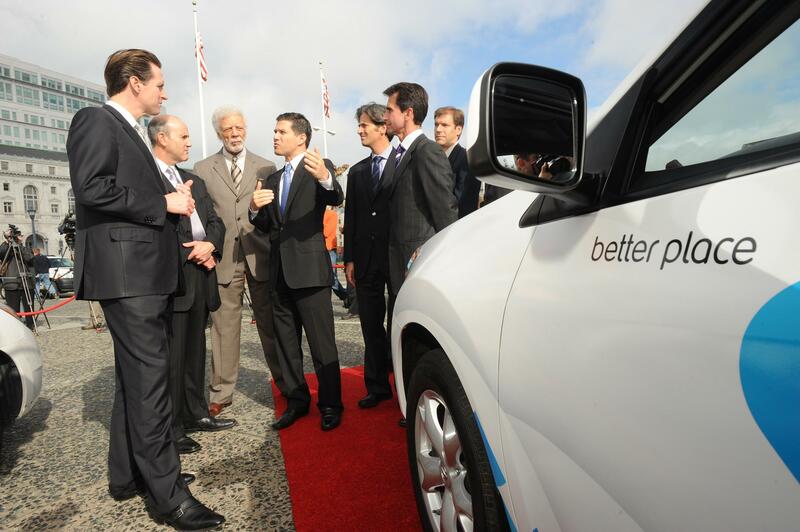 As a proud San Francisco resident, I was happy to read this morning that the Bay Area has signed on with Better Place to do just that- create a vast network of recharging stations and battery exchange stations throughout the region. Better Place, based in Palo Alto, has developed a unique subscription model, similar to the model employed by most cell-phone companies. By subscribing to a certain mileage plan, buyers will get electric vehicles at a discounted price (even free in some markets! ), making the barrier to entry much lower than other cars. And with 250,000 charging stations and 200 battery exchange stations throughout the region, buyers won’t have to worry about running out of juice on a trip to Ikea. Better Place has already signed similar deals in Australia, Israel and Denmark, and will hopefully continue to spread their networks throughout the world, saving money, emissions and our all-too-precious petroleum.